Butterflies I am about to serve up a super HOT 'Social Media Sandwich'! It's literally the mother of all Social Media Events, it's more than a 'Virtual Tea Party' it's a Social Media Movement! And the best part? There are TONS of ways to play! 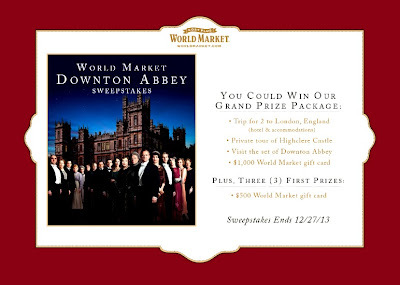 If you are a fan of the show Downton Abbey, then this is going to be right up your alley! And if tea hits the spot for you on a cool winter day, then put that pinky up and get ready to join in the fun! 1. On December 8th make your favorite tea and put it in your prettiest tea cup! 2. Put up that pinky! Then take a sip, but don't forget to take a photo! 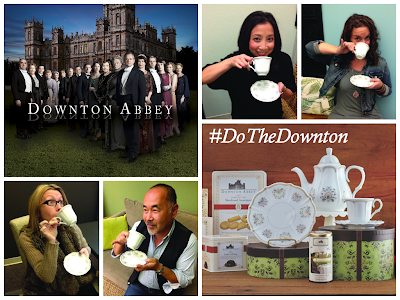 A friend can take it for you or you can totally rock out with a tea drinking selfie! These prizes will be drawn by Cost Plus World Market and winners will be notified directly by Cost Plus World Market! Do you want to win a Dream Trip to London literally fit for royalty? These prizes will be awarded directly by Cost Plus World Market! The Official #TwitterPartyDJ is hosting a 'Social Media Hop', this is not just a twitter party my friends, it's a party for the most popular of the social channels, so you don't like twitter no worries, join us on facebook, don't have either of those but like Google +, cool you can join us there too! Remember, pinkies down for typing! 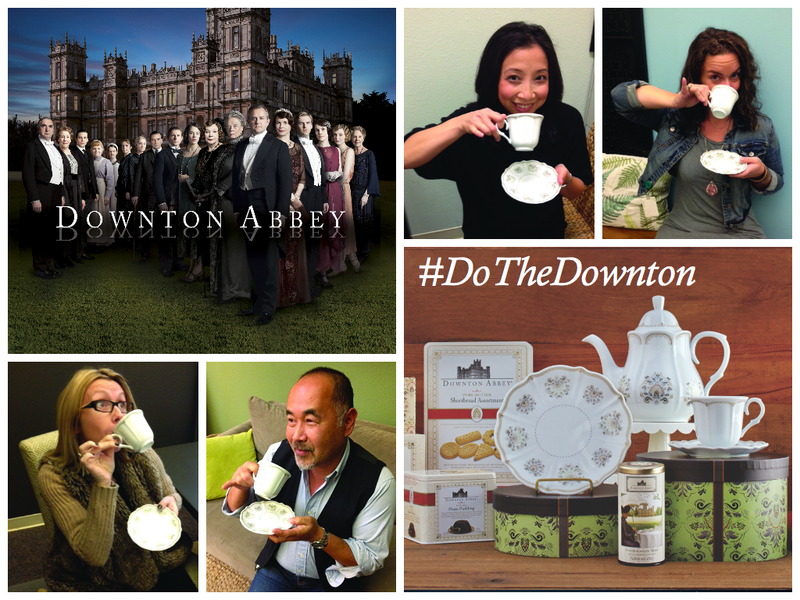 Hashtag: #DoTheDownton - This hashtag will be used on ALL channels so be sure to use this hashtag in all your tweets, status updates on facebook and google plus as well as instagram! Ƹ̵̡Ӝ̵̨̄Ʒ - 11 am PST / 2 pm EST - Twitter: The party kicks off on twitter (the door prize will be given away the first 15 minutes of the party! so don't forget to RSVP using the Rafflecopter RSVP Widget Below), there will be prize packs given away every 15 minutes! Ƹ̵̡Ӝ̵̨̄Ʒ - 12 pm PST / 3 pm EST - Facebook - The party will move to Facebook and there will be prize packs given away every 15 minutes there too! Ƹ̵̡Ӝ̵̨̄Ʒ - 1 pm PST / 4 pm EST - Google Plus - The party will become a Google Plus Hangout and there will be prize packs given away every 15 minutes here too! Ƹ̵̡Ӝ̵̨̄Ʒ - 2 pm PST / 5 pm EST - Twitter Again: The party starts and ends on Twitter, there will be prizes drawn every 15 minutes and the last prize is the GRAND PRIZE! The Twitter Party Prizes will be drawn by the party host and both the party host and co-hosts will be notifying winners throughout the twitter parties, so be sure to follow the sponsor @worldmarket, party host (yours truly), @Tracy_Iglesias and my secondary handle in case I get put in twitter jail @Ascending1), and our co-hosts @Mommy PR, and her secondary handle @Mommypr_feed and @jessienuez and her secondary handle @TheWiredFamily for party prizing announcements. Please note that the prizing during the Facebook Party and Google Plus Hangout will be drawn directly by our Sponsor Cost Plus World Market so follow all instructions in the status updates posted during the party on both of their pages. RSVP using the Rafflecopter Widget Below! Please RSVP using the Rafflecopter Widget Below! Please remember to follow the sponsor, host and all co-hosts as per rafflecopter instructions, we need to be able to Direct Message you if you win! Please note the 'Door Prize' and 'Grand Prize' as listed above in Prizing will only be drawn from those who RSVP, All 'Prize Packs' will be awarded to ALL active participants in the twitter party. FTC Dislcosure: This is a Sponsored Twitter Party in conjunction with Cost Plus World Market. All prizes are non-transferable with no cash redemptions, equivalents or substitutions except at Sponsor's Sole Discretion. Prize details and availability are subject to change and in the event that Sponsor is unable to provide a Winner with their Prize the Sponsor may elect to provide such Winner the approximate value of said prize in an alternate prize of comparable value. Prizes will be awarded via a random drawing and winners will be notified via Twitter's Direct Messaging System. All Winners must respond to the notification within 24 hours or an alternate winner will be selected. Party hosts and co-hosts are NOT responsible for shipment of prizing, shipping fees or insurance, prizes will be fulfilled by Cost Plus World Market. Sponsors or hosts are not responsible for lost, late or mis-directed mail. Winners are responsible for any taxes on prizes awarded. Odds of winning are based on the number of tweets, status updates and Google Plus participants during each respective entry period. No Purchase Necessary. Prizes will be honored and shipped to winners ages 18 + who are United States Residents. @Melissa - I am actually hosting, so if you have any questions just let me know. Look forward to 'seeing' you at the Virtual Tea Party. And can't wait to see your instagram photo too! I can't wait! This will be fun. 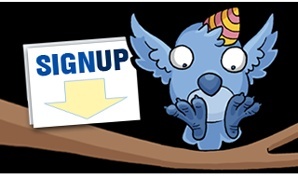 @Danell Eslwick - Thanks for signing up to join us, it's going to be FUN! Don't forget to tell your friends to join us too! @Abrie S Cheers! Can't wait to 'tweet' you! I can't wait. I love this show so much! Thank you for being an awesome company and making stuff for this show. I am tired of seeing superheroes everywhere. @Kristina - I will relay your message to Cost Plus World Market! Fans of the show have already purchased so many items that there is now limited availability, the only way to get certain items now is to win them during the party! We love World Market! What a fun idea! Just found this so awesome! Thanks!